Hyman PE, Milla PJ, Benninga MA, et al. Childhood functional gastrointestinal disorders: neonate/toddler. Gastroenterology 2006;130:1519-26. Iacono G, Carroccio A, Cavataio F, et al. Gastroesophageal reflux and cow’s milk allergy in infants: a prospective study. J Allergy Clin Immunol 1996;97:822-7. Cavataio F, Iacono G, Montalto G, et al. Gastroesophageal reflux associated with cow’s milk allergy in infants: which diagnostic examinations are useful? Am J Gastroenterol 1996;91:1215-20. Vandenplas Y, Rudolph CD, Di Lorenzo C, et al. Pediatric Gastroesophageal Reflux Clinical Practice Guideline Recommendations of NASPGHAN and ESPGHAN. J Pediatr Nutr 2009;49:498-547. Saint-Maurice D, Michaud L, Guimber D, et al. pH-métrie œsophagienne et manifestations respiratoires récidivantes de l’enfant : est-il possible de limiter l’enregistrement à la période diurne ? Arch Pediatr 2002;9:1236-40. Working Group of the European Society of Pediatric Gastroenterology and Nutrition. A standardized protocol for the methodology of esophageal pH monitoring and interpretation of the data for the diagnosis of gastro-œsophageal reflux. J Pediatr Gastroenterol Nutr 1992;14:467-71. Wenzl TG, Moroder C, Trachterna M, et al. Esophageal pH monitoring and impedance measurement: a comparison of two diagnostic tests for gastroesophageal reflux. J Pediatr Gastroenterol Nutr 2002;34:519-23. Hassall E. Over-Prescription of Acid-Suppressing Medications in infants: How it Came About, Why It’s Wrong, and What to Do About It. J Pediatr 2012;160:193-8. Chen IL, Gao WY, Johnson AP, et al. PPI use in infants: FDA reviewer experience. 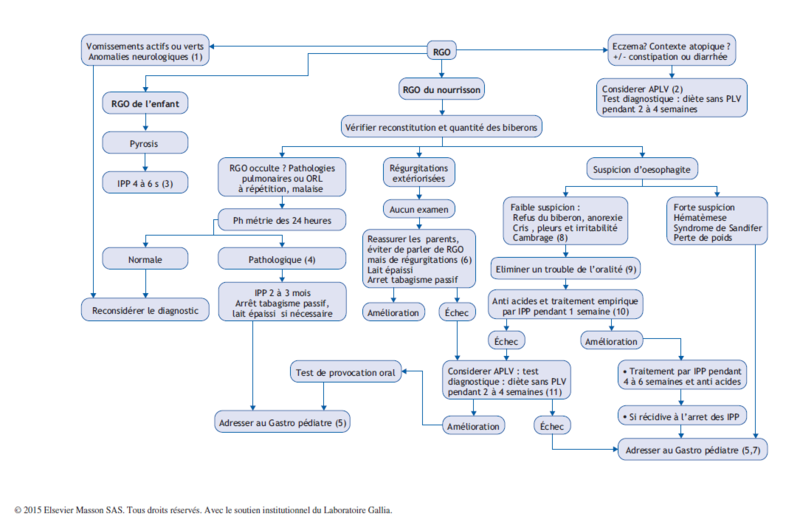 J Pediatr Gastroenterol Nutr 2012; 54:8-14. Scherer D, Zikmund-Fisher BJ, Fagerlin A, et al. Influence of “GERD” Label on Parents’ Decision to Medicate Infants. Pediatrics 2013;131:839-45. Orenstein SR, Hassall E, Furmaga-Jablonska W, et al. Multicenter, double-blind, randomized, placebo-controlled trial assessing the efficacy and safety of proton pump inhibitor lansoprazole in infants with symptoms of gastroesophageal reflux disease. J Pediatr 2009;154:514-20. Gastro-oesophageal reflux disease: recognition, diagnosis and management in children and young people. National Institute for Health and Care Excellence (NICE), 14/01/2015. Mouterde O, Chouraqui JP, Ruemmele F, et al. Cessons de prescrire des inhibiteurs de pompes à proton pour suspicion de reflux gastro-œsophagien, en dehors des indications justifiées ! Arch Pediatr 2014;7:686-9.